The Livistona chinensis or Chinese Fan Palm is a much-loved fan palm that has been popular since Victorian times and makes a superb potted palm for the home or terrace. In warmer climates and over a period of years, the Chinese Fan Palm grows into a handsome, medium-sized tree with a slender trunk. The Chinese Fan Palm is hardy in Zone 9 and can take freezing temperatures in the upper 20's with a mild frost. 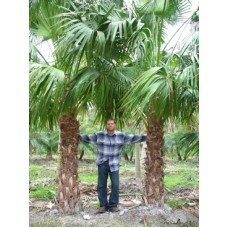 In warmer climates and over a period of years, the Chinese Fan Palm grows into a handsome, medium-si..